On the floor of Paola Divieti Pajevic’s office at Massachusetts General Hospital sits a large silvery suitcase that holds precious cargo: a set of minimalist equipment and electronics for conducting a cell biology experiment in space. Sometime in 2014, this payload will journey more than 200 miles above the earth to the International Space Station, or ISS. Inside the case, cells will grow on scaffolds in several cylinders called bioreactors. But Divieti Pajevic’s research doesn’t focus on space. The biologist wants to unravel the mechanisms through which bone cells called osteocytes sense and respond to mechanical forces. It’s clear that mechanical stimulation causes bones to grow, and that lack of it leads to bone loss—and weightlessness in space takes away most stimulation, leaving astronauts’ bones at risk. But how do physical forces actually change cells’ biochemistry? The answers, derived partly from this experiment, might help create better therapies for osteoporosis, a condition of naturally occurring bone loss afflicting millions. Divieti Pajevic’s work is supported by a program recently launched by the National Institutes of Health that gives biomedical researchers access to the ISS to study important questions that can be answered only in space. She wants to discover how cells behave when they’re in free fall, with all mechanical forces removed. That’s what happens to astronauts in orbit who experience weightlessness—known as microgravity (there’s a small amount of gravity in an orbiting spacecraft). When her osteocytes return from space, Divieti Pajevic will analyze the activity of their genes, with particular focus on a gene called sclerostin, which interferes with bone formation. In the meantime, in her earthbound lab, other bioreactors are rotating at a speed designed to mimic microgravity, but because the cells still experience some forces, it’s not clear whether the bioreactor precisely captures what happens in space. Hence the experiment in real weightlessness. “For us it would be a proof of principle that we really are simulating microgravity,” she says. Before space travel, it was difficult to study or even imagine life without gravity. It keeps us firmly planted on the ground, gives our movements something to resist and creates an orientation of up and down. 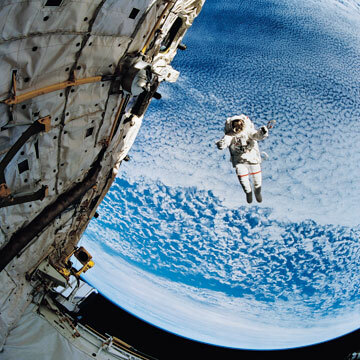 As humans began spending extended periods in space, however, it became clear that weightlessness interferes with the health of bones, muscles, the cardiovascular and immune systems, and our sense of balance. Beginning in 2000, the ISS complex, as long as a football field and containing the equivalent of a large house in habitable space, has hosted more than 200 crew members who have spent weeks or months in weightlessness. Studying their health has provided insights into the effects of microgravity, and the ISS now functions as a national laboratory. Some research has focused on keeping astronauts healthy, but other work, including Divieti Pajevic’s new study, has intriguing connections to health problems on earth—not only osteoporosis but also paralysis, balance disorders, immune deficiencies and aging. The most obvious effect of microgravity is sensory. Vision tells us where up and down are, our sense of touch registers contact with the ground, and our proprioception—an internal sense of the body’s position—provides feedback about our own movements. These signals are coordinated so seamlessly that we have little awareness of them. But in weightlessness, that system is disrupted. Motion sickness, among the first health problems most astronauts experience, is thought to stem from conflicting sensory signals. The brain, ever adaptable, helps most people acclimate within a few days, says Scott Wood, a scientist for NASA’s Human Health and Performance Directorate. But they must find new ways of moving. On earth, we work to maintain a stable center of gravity; in space, people have to learn to initiate movement by pushing off objects. Reconditioning experts help crew members returning from space to get back in sync with when they are moving relative to gravity again. Simply tilting the head back or stooping to pick up an object can be difficult during the first few hours. Astronauts participate in postflight reconditioning that starts with movements and balancing postures that are extremely simple and works toward others progressively more complex. 1. “To Infinity...and Beyond! Human Spaceflight and Life Science,” by Millie Hughes-Fulford, The FASEB Journal, September 2011. Hughes-Fulford, a biologist and former astronaut, outlines the history of studying space’s effects on the human body. 2. “Sensorimotor Reconditioning During and After Spaceflight,” by S.J. Wood, J.A. Loehr and M.E. Guilliams, NeuroRehabilitation, Volume 29, Number 2, 2011. NASA researcher Scott Wood and colleagues describe the profound effects of microgravity on the motor and sensory systems. 3. “Benefits for Bone From Resistance Exercise and Nutrition in Long-Duration Spaceflight: Evidence From Biochemistry and Densitometry,” by Scott M. Smith et al., Journal of Bone and Mineral Research, September 2012. Evidence that NASA’s concerted efforts to improve nutrition and exercise in space (with an exercise machine that can provide a whopping 600 pounds of resistance) offsets bone loss.